On Friday, 2nd March, Dr Caroline Lucas, the Green’s Member of the European Parliament for the southeast, visited the Radley Lakes to witness the appalling destruction being wreaked on the once beautiful Thrupp Lake by RWE npower. 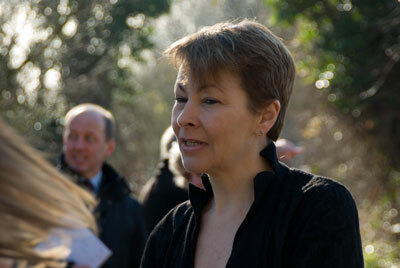 Caroline Lucas, said that RWE npower’s plans wouldn’t just destroy Radley lakes – but it would fuel climate change too. “Didcot A power station is one of the largest and dirtiest power stations in the UK. It emits about 1% of the country’s total greenhouse gas emissions. 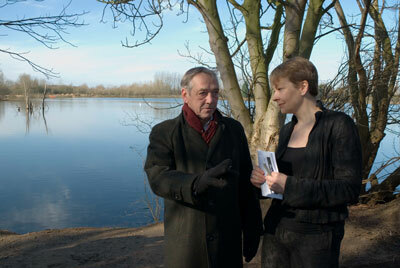 It now intends to dispose of the ash by filling one of Oxfordshire’s best loved lakes. This would be deeply unfortunate in any circumstances, but it is made worse by RWE npower’s failure to properly examine alternatives. “Technologies now exist for productively using power station ash as a replacement for bricks and cement. Scottish and Southern, one of the UK’s other major electricity suppliers, has recently announced it will use convert all the ash from the Fiddler’s Ferry power station in Cheshire into useful material for the construction industry and other uses. Why can’t RWE npower do the same? while npower contractors remorselessly continue their destructive activities in the background.